One of the most important facets of the Alf Museum is its integration into The Webb Schools, and the extensive opportunities that students have to work with real paleontologists. This is a powerful educational model, and one that deserves to be used more widely. Yet, it is difficult to implement because professional paleontologists are often hesitant to engage in these kinds of efforts with K-12 students for a variety of reasons: lack of time, lack of recognition of its importance by universities, or a shortage of funding, among others. 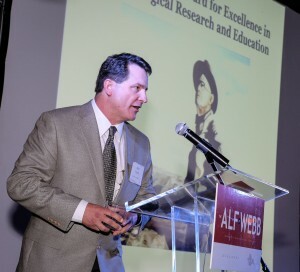 In order to encourage and recognize endeavors outside of Webb, the trustees at the Alf Museum have implemented the Raymond M. Alf Award for Excellence in Paleontological Research and Education. It honors a paleontologist who pursues outstanding original scientific research as well as outstanding education and outreach at the primary and secondary school (K-12) levels in the spirit of Ray Alf. Dr. Kent Smith of Oklahoma State University’s Center for Health Sciences was the first recipient for the award, given at the 23rd Annual Peccary Society Dinner. Dr. Smith is a professor of anatomy, associate dean for the university’s Office for the Advancement of American Indians in Medicine and Science, an affiliated research associate of the Sam Noble Oklahoma Museum of Natural History; and co-founder of the Native Explorers Foundation. This foundation creates innovative educational programs around the disciplines of anatomy and vertebrate paleontology, with the goal of increasing the number of Native Americans pursuing careers as scientists, educators, and physicians. As his colleagues attest, Dr. Smith’s “unwavering commitment to encouraging students,” has ignited a passion for paleontology and scientific inquiry in countless young minds. He empowers students to explore opportunities, try difficult research projects, and to imagine themselves as scientists. His student-empowering philosophy is akin to that of Raymond Alf. “Our initiatives will increase the number of American Indians practicing medicine and working in the science fields through mentoring and targeted programs,” said Smith.